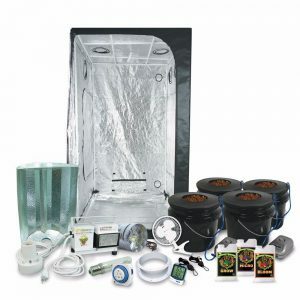 If you want to start growing marijuana, then a grow box is the best choice. This is because not only do you not have to worry about what to get for your grow room, but you also don’t have to worry about going out and purchasing all of them and comparing which ones will be worth buying. This is because with a grow box, you get everything included so that all you have to do is find a place to put the grow box and get the seeds you want to grow and get to growing! 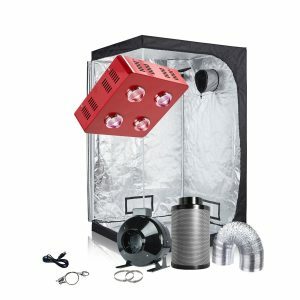 Although grow boxes are a bit more expensive than grow tents, it may be worth getting the box if you are a beginner as the learning curve to know which ones to get is a bit difficult. As it is hard, even for experienced growers, to locate and find great quality grow boxes, we have gathered a list of the best grow boxes on the market for beginners, intermediate growers, and even expert growers. Not one is better than the other as each has its own advantages and are perfect for a different person. We recommend that you read our reviews of the best grow boxes and make your choice. The first product we recommend is the Cash Crop 5.0. This is because this box can produce an astonishing 5 pounds of marijuana per year using the nutrients that come with this box. Other than seeds, you won’t have to get anything else as this box comes with everything you’ll need at an affordable price. Compared to similar products out on the market, this one is an affordable model. Its size is 27.75” T x 16.5” W x 11.25” D and if you decide you want it a little bigger, you can choose to do so when you purchase this grow box. This product comes with an LED light that is powerful and effective when growing. This is because it produces close to no heat, which is essential if you want to keep the temperature inside the box as constant as possible, due to the help of fans that come alongside the LED. This system comes with an intake and exhaust system as well as an air pump to make sure that your box can simulate the best possible environment for your plants to grow in. Lastly, this box comes with hydroponic pots with RX Green Nutrients which are known to produce very good results. Overall, this box isn’t too expensive or too cheap, and comes with a system that would be enough for a decent harvest every year. Yes, this can only produce 5 pounds of cannabis per year if grown correctly, so if you want more, you’ll have to check out the other boxes on this list. The next product we will be reviewing is the Grandma’s Secret Garden 4.0. It can produce 7 pounds of cannabis every year, which is a bit more than the first one we reviewed as it can only produce 5 pounds. However, this product is a bit more expensive which makes sense since it is a bit bigger and can hold and produce more capacity. The size of this box is 36” Tall x 20” Wide x 16.5” Deep, making it one of the best indoor grow boxes you can get due to its average size. It isn’t too big to be noticed or too small to not hold enough capacity. This product comes with Mars Hydro LED Grow Lighting which is one of the best LEDs to use if you are growing cannabis. It also comes with an air pump with an intake and exhaust system that will help facilitate air inside your grow box. You also get 2-inch hydroponic pots as well as RX Green Nutrients with plant starter plugs. These will help get you started and on your feet to start growing, as they will be all you need when you start growing. Overall, we loved this one as for the addition of a couple hundred dollars, you get access to a grow box that can hold a lot more and can produce a lot more. This will allow you to get a decent harvest and not regret buying a bigger box as the capacity is around average with this. The next product is the Growzilla 3.0. Just by the sound of the box, it sounds impressive, and yes, it is. It can produce an immense amount of marijuana per year, more specifically 9 pounds. Imagine everything you can do with 9 pounds of weed! It is a lot bigger than the other products in this list and is a lot more expensive in return as well. The size of this box is 48” Tall x 20” Wide x 16.5” Deep and can be upgraded to 68” Tall if you want it a bit bigger with an additional upgrade. It comes with Powerful Mars Hydro LED Grow lighting which works in perfect sync with most plants. As the height of the light can be adjusted inside the box to whatever you need it to be, you can grow almost any plant in it. It comes with an air pump alongside an intake and exhaust system to allow air to go in and out to keep the air inside the box fresh for the plants to use. You also get a water pump with hydroponic pots alongside RX Green Nutrients to help you get started growing. 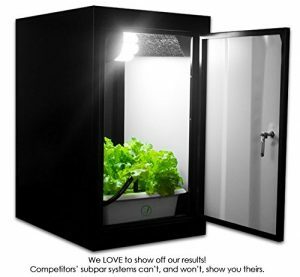 One thing to note about this box is that it’s a vertical grow box. This means that the plants will start growing from the bottom of the box towards the light on top. Although this sounds normal, you’ll be able to see what we’re talking about when you see an image of the box. Overall, this box is recommended for those that are okay with spending a bit more on the box as long as they get a bigger grow box and a bigger yield at the end of the year. For those that are into selling and personal medical marijuana use, this investment may be a lot more cost-efficient in the future compared to the smaller boxes. For the next product, we have a bit of a special box. The Super Star is the one of the most expensive grow boxes on this list and rightfully so because it can produce a jaw-dropping 16 pounds of cannabis a year! The size is a lot bigger than the ones we have reviewed so far and the supplies that come with it exceed in quality compared to other similarly priced ones on the market today. The size of the box is 60” H x 24” W x 24” D and comes with two 24w T5 fluorescent bulbs. These bulbs will work perfectly with your 16-plant setup and as this box is mainly for those that want to automate most of the tasks, it is the perfect grow box for beginners. It comes with a carbon filter as well as a cloning chamber which isn’t normally seen in these boxes. As we said before, this box is perfect for beginners and this is because it comes with instructions, alongside a DVD, that will help you setup the box to make it run on autopilot and grow marijuana with minimal effort on your part. 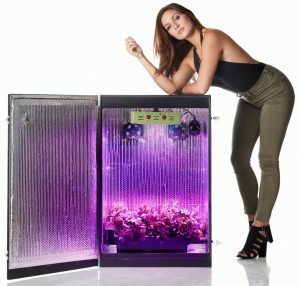 Overall, this box isn’t recommended for everyone, but for those that are okay with spending a bit more money for more capacity and an easier growing experience. If you value your time, then this may be a great investment as you’ll save a lot more time with this compared to other boxes. We also consider to be one of the best stealth grow boxes as it is shipped by a freight company that will make sure that it goes directly into your hands with minimal exposure to make sure that no one suspects you of growing weed. It also can be hidden and camouflaged as a safe just in case. The next product we will be reviewing is the TopoGrow kit. Although not expensive, it isn’t the most budget-friendly box we have on this list. However, it is quite large and can produce quite a bit of marijuana per year, so if you are interested in an average grow box that’ll meet most of your needs, this might be worth looking at. The size of this box is 13” x 5” x 21” and comes with a 200 PCS x 3W LED. It is 600 watts and can feed enough light into your plants for them to grow in a healthy manner. As it also comes with 4 cooling fans, the LED shouldn’t produce heat that will affect your plants growth. This will allow you to control the temperature yourself to allow your plants to grow in a consistent temperature that is recommended for plants. 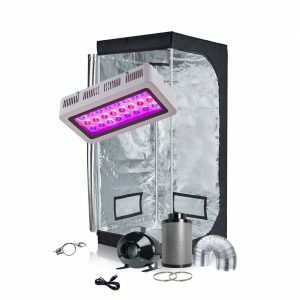 This box also comes with reflective Mylar which will enhance the reflectivity inside the grow box to aid the plants in growing faster and healthier. Overall, this box isn’t much unique or have anything special about them. However, if you don’t want any bells and whistles to come along with your box and just want something that will do what it’s supposed to do consistently without any malfunctions, then this one might be the one you are looking for. Since it comes at an affordable price and can produce quite a bit, it isn’t a bad choice. 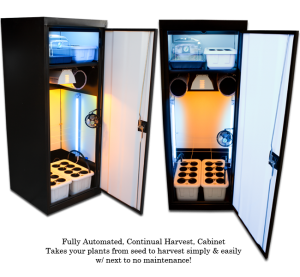 If you are looking for a professional grow box, then the SuperCloset is worth reading into. Its capacity is quite large and despite its high price point, we highly recommend it due to a few reasons. First, it takes everything into consideration that may affect the growth of your plants. Normally, not all plants grow the same and replication isn’t common 100% of the time because of outside variables affecting the result. However, the creators of this box have made sure that nothing can affect inside variables which is why we recommend this box as a “professional” grow box. It comes with a CFL lighting system and is a SuperPonics system that is very close to fully automated. To sum it up, if you want to clone and germinate your plants and succeed 100% of the time, then this one is the only one that can do that for you as others will only be able to offer 95% at the max. Although it is a bit pricey, it will be worth it in the end eventually. If you are a complete beginner and are okay with spending a bit more than average, then the Complete Grow Box from HTG Supply is one of the best choices you can make. It can support only a few plants but can hold quite a bit of capacity. It is 39” Long x 39” Wide x 85” High and comes with a 400-watt HPS grow light from HTG Supply. This light will be more than enough to support your plants growth from start to finish. It also comes with a thermometer as well as a circulation fan to help regulate the temperature of the box to make sure your plants don’t get affected from any outside variables. It is extremely important that the temperature remains consistent or else your plants might all die off. Overall, this box isn’t too special, but it is a plug and play product that will allow even the naivest beginners to start growing without much research. If you are okay with investing a bit more than average, then we highly recommend you get this as it is simple to setup and start up. 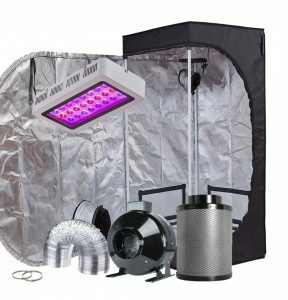 Another box from TopoGrow, this product was added to this list so that those that are looking for budget grow boxes can get something without having to break the bank. It is 32”x32”x63” and comes with a 100PCS x 3W LED. This LED will allow you to use the feature called “full spectrum” which means that your plants can receive all wavelengths of light. This will allow your plant to grow in the fastest way possible while maintaining high yields and health. You also won’t have to go out and get any other light as this LED will allow you to grow your plants from start to finish. This box also comes with heavy oxford cloth to prevent any outside variables such as temperature to affect your plant’s growth. Overall, this box isn’t much different from the others except that it does drop a bit in terms of quality and doesn’t hold as much, but can give you what any other grow box can give you in terms of growing speed and yields proportional to the plants planted. For the next product, we have the last TopoGrow Grow box of this list. TopoGrow is a significant player in this market and produces high quality grow boxes which is why their products have been reviewed several times in this review. Although this box is a bit more expensive, its quality and features will make it worth looking at. The size of this box is 48”x48”x80” and comes with an 800-watt full spectrum grow light. This means that the power of the light is quite intense and will be perfect to give your plants enough light to allow proper growth. As this product also comes with a 96% reflective Mylar, the light will have an easier time being distributed amongst all the plants. This box comes with a 6” fan alongside filters and ducts to allow the air inside to be facilitated well and prevent the plants from having any bad air inside its grow box. If there were bad air inside, it will prevent the plants from doing photosynthesis properly and will inhibit proper growth. Overall, this box is great for those that are looking for a box that will give them all they’ll need to grow their plants in a healthy manner while not breaking the bank. If you are interested in the high-intensity light alongside the reflector with its eye-pleasing price, then this one might be the best choice for you. For the last product we will be reviewing, we have one more budget-friendly grow box for those that are on a tight budget. Although it is quite small and can’t hold much, it will be more than enough for what you might be looking for at least price range. At this price, don’t expect much as the best you’ll probably get is a tent with a couple of additional features. However, this grow box is a bit unique as it is a lot better compared to similarly priced grow boxes. It is 13” x 5” x 21” and comes with a 600-watt 200 PCSx3W LED. 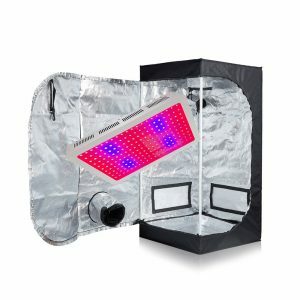 As this is brighter than LEDs that come with more expensive grow boxes, your plants might grow even better with this box than the others. However, note that this box won’t be able to store as much, which might make this box not produce enough for your needs. If you need more capacity, then we recommend you up your budget a bit to be able to afford some of the ones we recommended above. Overall, this is a very budget-friendly grow box that will allow you to plant and grow your plants in a stealthy manner (due to its small size) and without costing you a lot of money. We hope that by reading our reviews of the various grow boxes above, you have made your choice and found the grow box that fits your needs and at the price you were looking for. Since a grow box comes with everything you’ll need for your first harvest, we highly recommend that you start off with a grow box instead of anything else to ensure that you will have a successful harvest. 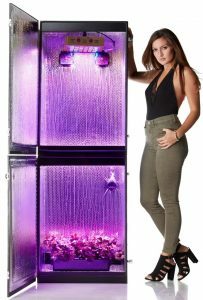 Not only will this give you the experience you’ll need to grow plants yourself without the need of a grow box, but this will also give you motivation as you’ll know the feeling of a successful harvest. As each box is a perfect fit for different individuals, you may have to look around before finding the perfect one for you. Growing is a fantastic hobby and having your own growing setup will allow you to save a lot of money, especially if you need it periodically for medical needs.